This is high time when farmers express their gratitude for a good harvest and pray for prosperity in the coming year he added. Dehradun. Jan 14, 2016. 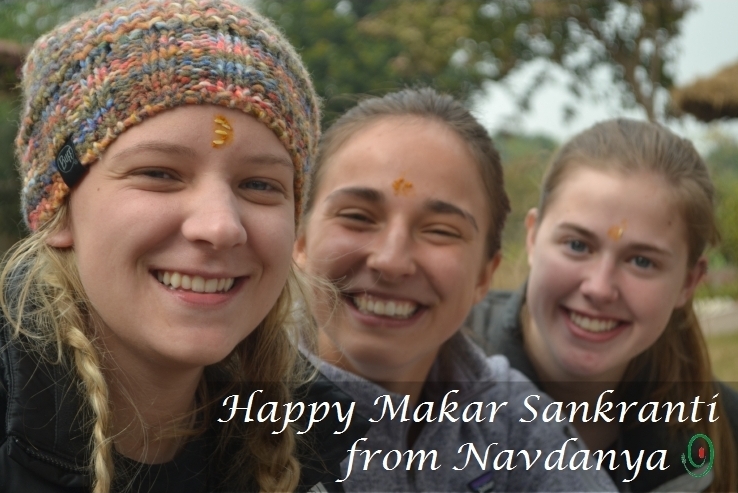 Navdanya is celebrate Makar Sankranti with staff members and a visitor group of 11 students from University of St. Thomas (Minnesota) , USA at the biodiversity conservation farm, Ramgarh, Dehradun. ‘India is a country of festivals and Makar Sankranti is a harvest festival, generally a celebration of an annual harvest, which generally happens during the time of the main harvest of the particular region.’ Mr. J.P.Khali, farm manager Navdanya said. He was introducing about this winter festival to visitor’s group and Navdanya’s staffs. It celebrated usually on January 14th every year across the country. This is high time when farmers express their gratitude for a good harvest and pray for prosperity in the coming year he added. ‘Makar Sankranti marks the transition of Sun into the Makara Rashi which is a zodiac sign. People believe that this auspicious day marks the spring of India which is a traditional event. This festival is also regarded as the beginning of an auspicious phase for Indian culture.’ Dinesh Chandra Semwal, coordinator media and documentation said. He said that On this festival, Sun God begins its ascendancy and enters into northern hemisphere. And thus the Sun God reminds us of ‘Tamaso Ma Jyotir Gamaya’ it means one should turn away from darkness of delusion and should enjoy a new and happy life. ‘The Sun moves from one direction to the other which gradually changes from one zodiac sign to the other. This change is known as Sankranti. Further the sun moves into the Capricorn zodiac which is termed as Makara, hence the name ‘Makar Sankranti’ name evolved’. Mr. Semwal added. At this occasion all member enjoyed yummy and traditional recipe of ‘Khichadi’, delicious sweets, jiggery and peanuts and sesame too. This festival brought as much excitement for visitors with kite flying and a bonus trip to Navdanya Farm. No Comments to "Navdanya celebrates Winter Festival: Makar Sankranti"